Building a custom drapery business this way will knock your socks off!! You'll see how to be successful too just by following the steps we took when setting out building a custom drapery business. We started our window treatment business in our home. After 7 or 8 months our life was a zoo and our home a mess with "stuff" everywhere. We moved the business into a 1,080 sq. ft. space on the edge of our neighborhood business district. First, we needed to determine how to reach potential customers who thought custom window coverings were too expensive for them. We wanted to go after the "mass market" of people who buy pre-packaged draperies and curtains off the shelf from retailers. After much thought we decided to name our business Decorate With What You Have. Essentially, we charged $75 to spend an hour in client homes to help them decorate with what they already had. This included when necessary, the proper placement of furniture, pictures and decor touches for maximum visual effect. Prospective clients wanted to spend that $75 with us because we were non-threatening in any way. Our name said we were not decorators who just “wanted to sell you something." This got us in the door. Many women sincerely wanted our help. Some just wanted us to come to their home to verify that they were good decorators. We were able to make decor suggestions to every client. No matter the case, we were very busy with appointments within three months of building a custom drapery business from home. Fully 58% of all the scheduled decorating appointments turned into clients who purchased window treatments, wall coverings, blinds or faux painting services from us. During the course of our service we “softly” made suggestions for this or that kind of window treatment for a variety of windows and French doors. We also noted how wall coverings, faux painting and blinds could achieve the desired “decorating pop” the client wanted. You too can incorporate this basic home decor ability in building your custom drapery company. The window treatment area is BIG Opportunity! Here’s what you will find hard to believe. 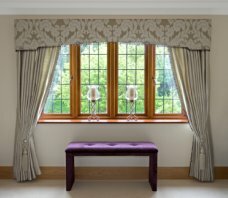 When you purchase window treatment fabric from a supplier your retail price to your customer is at a minimum twice what the fabric cost is to you. The same applies to all wall coverings and blinds you sell. As our sales rose with each supplier, our material costs were lowered, thus improving the profit margin. On each style of window treatment we estimated our sewing time (after 3 or 4 practice jobs, we got fairly good at this), and gave our client a set price for our labor plus the retail cost of the fabric. We figured our labor at $45hr. initially but in month 9, our labor rate rose to $65hr. We still gave the client a great value. Without correctly pricing your services, you do not have a profitable company. About 11 months after we started, we were making and completing window treatments for 4 clients weekly, sometimes even 5 clients. In addition, our wall covering and faux painting weekly sales averaged over $1,100 with a 56% gross profit. Yes, times were good. Our average client window treatment sale approached $880 of which, our gross profit was nearly $560. This income adds up real fast. Occasionally, we had to farm out our work to a “window treatment workroom” and to an installer because we were too busy to give outstanding service. 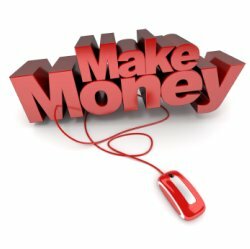 When we did this our gross profit dropped from $560 to $300-$325. Still, building a custom drapery business, in retrospect, was the best life changing decision we ever made. When a department store or independent custom window treatment retailer runs a sale at “70%-off,” our client’s price was still far below that price! Retailers may advertise an item at 70%, 80% or 90%-off the “regular price” because, by law, custom-made products require no “regular retail price” be shown in their advertising. So, the discount price is really just to make the customer feel good! NOTE: If you do not feel comfortable with measuring windows for custom-made treatments or with hanging the finished product, you can contract with a workroom for this service. The same is true if you choose to sell wall coverings and a customer wants them installed or if they want one or more walls faux finished. You may be all things to all people but you do not need to personally participate. Just add a mark-up on the contractor price, if appropriate. Picking the brains of others by making a small investment will save you time, mistakes and money. Each of the following is strongly recommended! Hope you found that beginning a custom drapery business may indeed be a goldmine. Sometimes, out foxing your competitors by appealing to the mass market of "off the shelf" window covering buyers,can be an important marketing approach for success. This interesting topic, Starting a Profitable Home Sewing Business has a ton of information that maybe of value to you.